The title of this article comes from the book, Scripture Twisting: 20 Ways the Cults Misread the Bible, by James Sire. In this short but useful book, Sire discusses how cults of Christianity 1 misinterpret and misuse the Bible in support of doctrines and/or practices outside the boundaries of the Christian faith. A biblical text is referred to but is either not quoted in the way the text appears in any standard translation or is wrongly attributed. Example: The Maharishi Mahesh Yogi says, “Christ said, ‘Be still and know that I am God. '” Whereas this text is found ONLY in Psalms. The biblical text is retranslated, not in accordance with sound Greek scholarship, to fit a preconceived teaching of a cult. Example: Mormon missionaries quote James 1:5 which promises God’s wisdom to those who ask him and, then, follow this by explaining that when Joseph Smith did this he was given a revelation from which he concluded that God the Father has a body. A text of Scripture is quoted but removed from the surrounding verses which form the immediate framework for its meaning. Example: Alan Watts quotes the first half of John 5:39 (“You search the Scriptures, because you think that in them you have eternal life”), claiming that Jesus was challenging His listeners’ over emphasis of the Old Testament, but the remainder of the immediate context reads, “and it is they that bear witness to me; yet you refuse to come to me that you may have life” (verses 39-40), which shows that Jesus was upholding the value of the Old Testament as a testimony to Himself. Two or more verses which have little or nothing to do with each other are put together as if one were a commentary of the other(s). Example: The Mormons associate Jeremiah 1:5 with John 1:2,14 and thus imply that both verses talk about the premortal existence of all human beings; Jeremiah 1:5, however, speaks of God’s foreknowledge of Jeremiah (Not his premortal existence) and JOhn 1:2 refers to the pre-existence of God the Son and not to human beings in general. A more detailed or specific conclusion than is legitimate is drawn from a biblical text. Example: The Mormon missionary manual quotes the parable of the virgins from Matthew 25:1-13 to document the concept that “mortality is a probationary period during which we prepare to meet God.” But the parable of the virgins could, and most probably does, mean something far less specific, for example, that human beings should be prepared at any time to meet God or to witness the Second Coming of Jesus Christ. A word or phrase from a biblical translation is examined and interpreted as if the revelation had been given in that language. Either (1) mistaking literal language for figurative language or (2) mistaking figurative language for literal language. Example of (2): The Mormon theologian James Talmage interprets the prophesy that “thou shalt be brought down and speak out of the ground” to mean that God’s Word would come to people from the Book of Mormon which was taken out of the ground at the hill of Cumorah. A predictive prophesy is too readily explained by the occurrence of specific events, despite the fact that equally committed biblical scholars consider the interpretation highly dubious. Example: The stick of Judah and the Stick of Joseph in Ezekiel 37:15- 23 are interpreted by the Mormons to mean the Bible and the Book of Mormon. A writer says that the Bible says such and such but does not cite the specific text (which often indicates that there may be no such text at all). Example: A common phrase “God helps those who help themselves” is not found in the Bible. To substantiate a given argument, only a limited number of text is quoted: the total teaching of Scripture on that subject would lead to a conclusion different from that of the writer. Example: The Jehovah’s Witnesses critique the traditional Christian notion of the Trinity without considering the full text which scholars use to substantiate the concept. A hasty generalization is drawn from too little evidence. Example: The Jehovah’s Witnesses teach that blood transfusion is nonbiblical, but the biblical data that they cite fails either to speak directly to the issue or to adequately substantiate their teaching. A biblical term is misunderstood in such a way that an essential biblical doctrine is distorted or rejected. 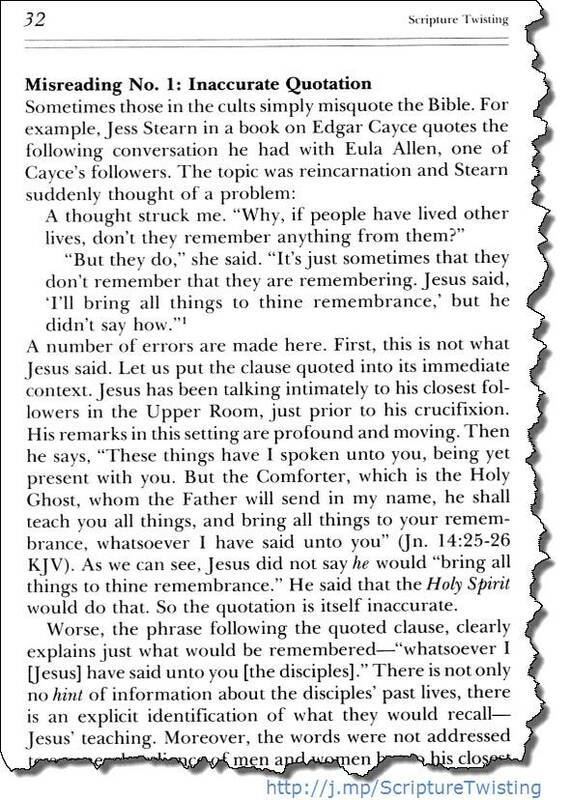 Example: one of Edgar Cayce’s followers confuses the eastern doctrine of reincarnation with the biblical doctrine of being born again. A specific interpretation given to a biblical text or set of text which could well be, and often have been, interpreted in quite a different fashion, but these alternatives are not considered. Example: Erich von Daniken asks why in Genesis 1:26 God speaks in the plural (“us”), suggesting that this is an oblique reference to God’s being one of many astronauts and failing to consider alternative explanations that either God was speaking as “Heaven’s king accompanied by His heavenly host” or that the plural prefigures the doctrine of the Trinity expressed more explicitly in the New Testament. Words like OBVIOUSLY, UNDOUBTEDLY, CERTAINLY, ALL REASONABLE PEOPLE HOLD THAT and so forth are substituted for logical reasons. Either (1) a cult writer a ssociates his or her teaching with those of figures accepted as authoritative by traditional Christians; (2) cult writings are likened to the Bible; or (3) cult literature imitates the form of the Bible writing such that it sounds like the Bible. Example of (2): Juan Mascaro in his introduction to the Upanishads cites the New Testament, the Gospels, Ecclesiastes and the Psalms, from which he quotes passages supposedly paralleling the Upanishads. Example of (3): The Mormon Doctrine and Covenants interweaves phrases from the Gospel of John and maintains a superficial similarity to the Gospel such that it seems to be like the Bible. Under the assumption that the Bible contains hidden, esoteric, meaning which is open only to those who are initiated into its secrets, the interpreter declares the significance of biblical passages without giving much, if any, explanation for his or her interpretation. New revelation from post biblical prophets either replaces or is added to the Bible as authority. Example: The Mormons supplement the Bible with the Book of Mormon, the Doctrine and Covenants and the Pearl of Great Price. Either the Bible as a whole or texts from the Bible are examined and rejected because they do not square with other authorities – such as reason or revelation = do not appear to agree with them. Example: Archie Matson holds that the Bible contains contradictions and that Jesus himself rejected the authority of the Old Testament when he contrasted His own views with it on the Sermon on the Mount. WORLD-VIEW CONFUSION Scriptural statements, stories, commands or symbols which have a particular meaning or set of meanings when taken within the intellectual and broadly cultural framework of the Bible itself are lifted out of that context, placed within the frame of reference of another system and thus given a meaning that markedly differs from their intended meaning. Example: The Maharishi Mahesh Yogi interprets “Be still, and know that I am God” as meaning that each person should meditate and come to the realization that he is essentially Godhood itself. This material comes from the appendix of James Sire’s Scripture Twisting Methods of the Cults [Kindle edition], and summarizes his in-depth treatment of each of these points. This book should be part of every Christian’s library. Scripture twisting is a common practice among abusive churches, and a common tool for those who engage in spiritual abuse.